You are in the right place. Three months after starting the Faraway Files travel blog community link up, we have 75 bloggers contributing and commenting and sharing and engaging. And whether you join in weekly or once in awhile, we are grateful for your stories. Your tales from faraway places. And while you could write about your backyard, like my contribution this week, it will feel far away to someone out there. You offer fresh perspectives and new points of view, even when you talk of places we already knew. It’s one of my favorite things about hosting. These are my favorites from the first link up of 2017. Urska from Slovenian Girl Abroad took us sledding in Switzerland. I am a little bit obsessed with my interest in snow right now and she fueled my fire. Zipping down 2.5km runs dedicated to sleds? Looks soo fun! Another community newcomer, Groove is in the Heart took us to warm and sunny South Africa and the most charming daily duck parade in a beautiful winery. I could drink to that! Seeing them run down the lane seems hysterically cute. Global Giraffe zipped us around misty corners of the famous Hai Van Pass in Vietnam. Don’t know if you fancy maneuvering a motorbike yourself? Don’t worry, you can ride along with Dan. 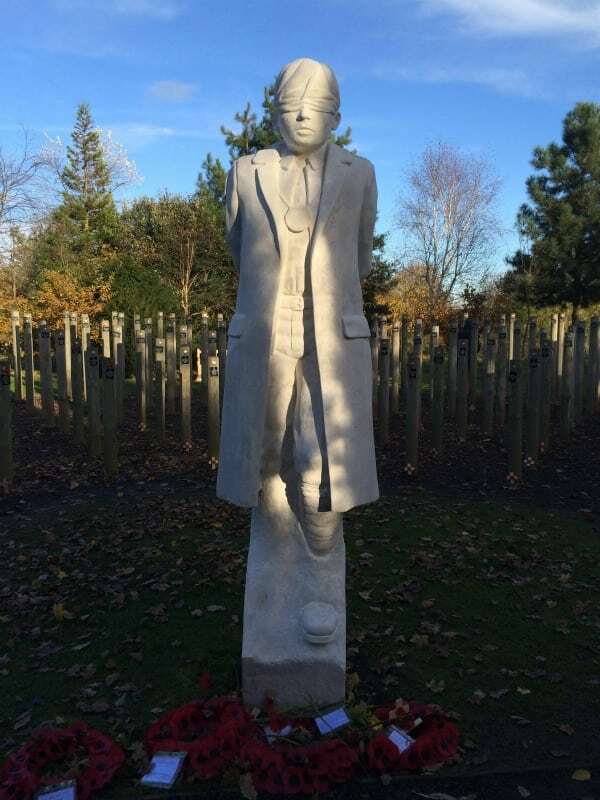 Perhaps most moving to me was the account of the Shot at Dawn Memorial in the National Memorial Arboretum in England. Trish from Mums Gone To has a personal connection as her uncle was instrumental in helping get pardons for the many young soldiers shot for deserting in WW1. It is a moving and chill-inducing story told from a personal perspective. The link up will go live every Thursday at 8 am, UK time (9 am, CET) until midnight on Friday. It will alternate between Untold Morsels, Suitcases and Sandcastles, and Oregon Girl around the World. This week, Clare is hosting over at Suitcases and Sandcastles. Go say hej here. Thank you Danielle! That makes me very happy to hear. I appreciate your contributions and energy here – cheers from Copenhagen! Thank you for choosing my post as one of your favourites, Erin. It was one of those posts which was quite exhausting and emotional to write so I am pleased it struck a chord with you and other readers. I’ll be back next week to join in the linky – it’s such a great way to find inspiring takes about the world we live in. Thank you all for hosting it and sharing your enthusiasm for travel.